The floral decoration and prop hire services are some of the best in the local area. We offer packages that are tailored to your needs and requirements. Our displays make perfectly eye-catching and impressive additions to churches, wedding venues, marquees, halls, proms, parties and corporate functions area. All flowers are beautifully created and finished to the highest quality, looking so natural that they’re often mistaken for fresh flowers. Hiring some or all of your wedding displays couldn't be easier, as floral decorations from FlowerMagic are reasonably priced and with no waste. Based in Langport, Somerset, we can style your venue with flowers and make savings of more than 60% on similar displays made with fresh flowers. All of our hire flower displays are available in ivory, white, or cream, interspersed with trailing foliage with your colour added as accents in ribbons, feathers, butterflies, or other flowers. We specialise in creating bespoke designs, giving you ultimate displays on your special day. We deliver, set-up and collect throughout Somerset, Dorset and Devon. Designed and arranged by top floral artists, our silk flowers are simply stunning, and we’re always in line with current flower trends. 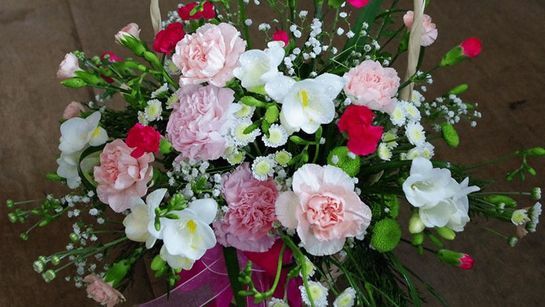 For further details on our floral decoration and artificial flower hire services, call us, in Langport, Somerset. The Batch Country House, Haselbury Mill, Hornsbury Mill, St Audries, The Manor (Yeovil), Northover Manor, The Old Cider Barn, Sherborne Castle, Rookery Manor, Rockbeare Manor, Woodlands Castle, Maunsell House & Mount Somerset - to name but a few!.